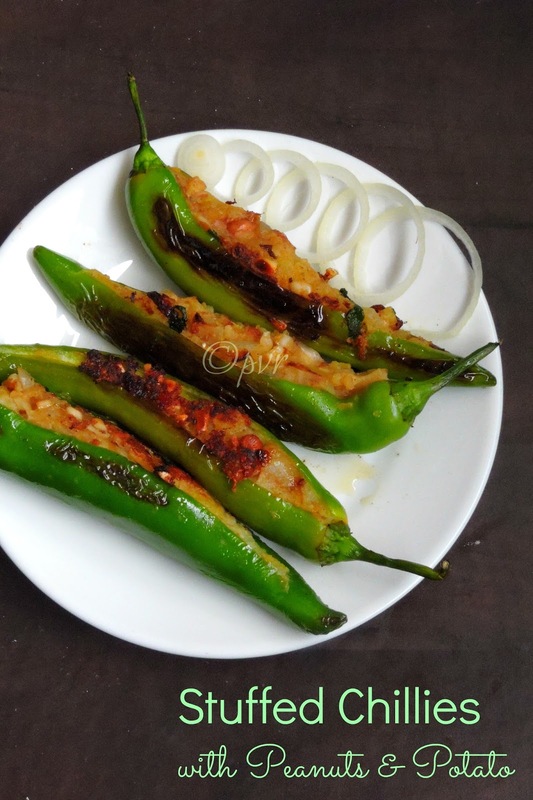 Sathya gave me chillies and peanuts as secret ingredients, however the first recipe came to my mind is Hyderabadi mirchi ka salan then somehow i felt like making a different dish and opted for this alluring,spicy and very delicious stuffed chillies aka stuffed peppers. Instead of making a dry stuffing with peanuts, i prepared a quick stuffing with cooked and mashed potatoes along with crushed peanuts, the addition of peanuts makes this stuffing more crunchy and nutty. Take care to remove the seeds from chillies carefully else your stuffed chillies will be more spicy. 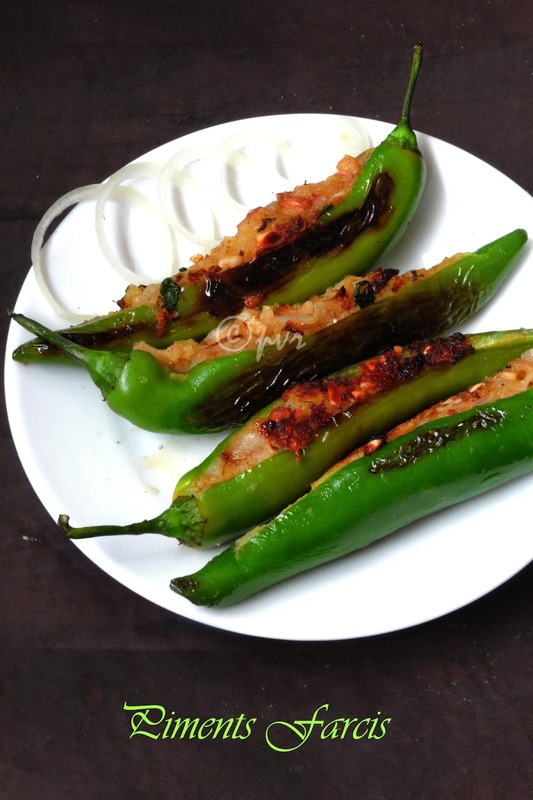 I used long green chillies, you can make the same stuffed chillies just with bellpeppers. 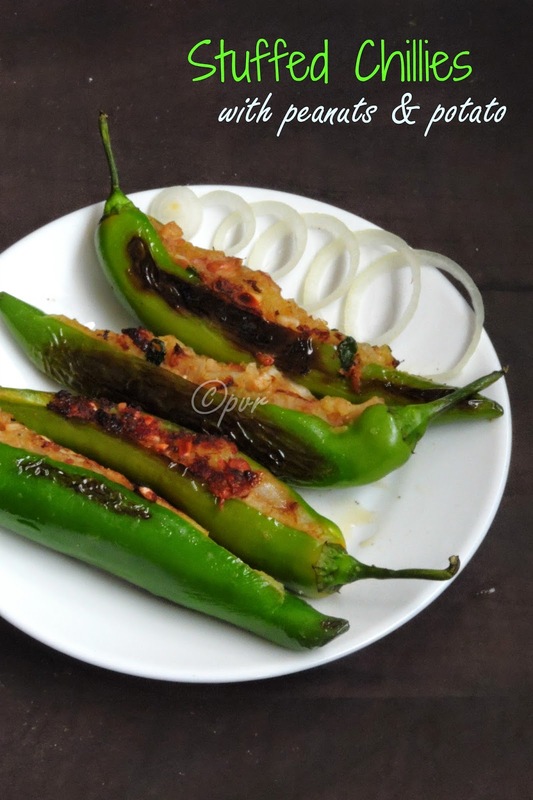 We simply loved this stuffed peppers, thanks to Sathya sis for giving me this interesting ingredients. Slit open the green chillies carefully, remove the seeds and keep aside. Bring boil water in a pan, add the chillies, keep aside for 5 minutes, strain the water and keep aside. Heat the oil, cook the chopped onions until they turns transculent. Add the crushed peanuts, saute for few minutes. Add the mashed potatoes,coriander leaves, garam masala powder, salt and cook everything for few minutes, put off the stove, keep aside. Stuff the green chillies with the peanuts-potato stuffing. Heat enough oil for cooking, drop the chillies and fry in simmer until the chillies gets well cooked. Ouvrir soigneusement les piments verts, retirer les graines et garder les à côté. Faire bouillir l'eau dans une casserole, ajouter les piments, laisser dans l'eau pendant 5 minutes, retirer les de l'eau et garder à côté. Chauffer l'huile, faire revenir les oignons émincés. Ajouter les arachides écrasées, faire revenir pendant quelques minutes. Ajouter maintenant les pommes de terre écrasées, les feuilles de coriandre, la poudre de garam masala, le sel dans les arachides et faire revenir le tout pendant quelques minutes.Couper le feu. Farcir les piments verts avec la farce. Chauffer l'huile pour la frire, déposer les piments farcis et les faire frire jusqu'à ce que les piments sont bien cuits. lovely recipe. I am going to try it out but with less hot version of chillis. 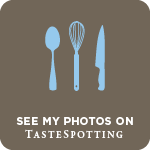 thats a yummy looking starter sis..looking forward to try . You are loaded with creativity and I love all ur recipes. So inspiring and this chilli is so tempting to make love it.